The Westerns originally came from the Low Countries and their skills were Flemish weaving. Robert WE Sterne came to the UK around the 1300's. The family later (1550's) became members of the Grocers Company in the City of London. A family tree was developed dating back to the mid 1600's where there is a record of Thomas Western having purchased Rivenhall in 1667-8. This property was in the hands of the Western family until the early 1920's (from memory). The hall in a state of neglect (from the outside) still stands, as does the old church, which has register dating from the year 1639. There is a pub, The Western Arms, in the village close to the church. My parents visited Rivenhall which is situated 2 miles from Witham Junction on the main line of the old London and North eastern railway, 39 miles for London and 8 miles south east of Braintree. Most of the early Westerns were entombed in and under the church, with more being buried in the outdoor cemetery when there was no more room within the church. The most famous of the early Westerns was undoubtedly Charles Callis Western, the first and last Lord Western of Rivenhall. His father Charles was killed in an accident with a chaise and runaway horses in which he, his wife Francis Shirley Bollan and the young 4 year old Charles Callis were travelling from Rivenhall to Preston. Charles senior jumped out to try to stop the horse, and was killed immediately, his wife threw the baby Charles out and he landed on a bush and was unhurt after which his mother jumped out and was unhurt. His mother never remarried and lived alternately with her two sons Callis and Shirley, neither of whom married.The branch stopped at this point but before Lord Western died he entailed his estates to his nearest kinsman Thomas Burch Western. Charles Callis on his coming of age in 1788 (21 years old) he inherited the Western estate at Rivenhall. No reference as to who commissioned the Copley work, has yet been found. Essex Review 1901 as follows - " There was a full length portrait of Lord Western by Simpson which hangs (in 1901 now place unknown) , as well as the earlier one by Copley of Lord Western and his brother Shirley Western as boys; and ..... by Hogarth. 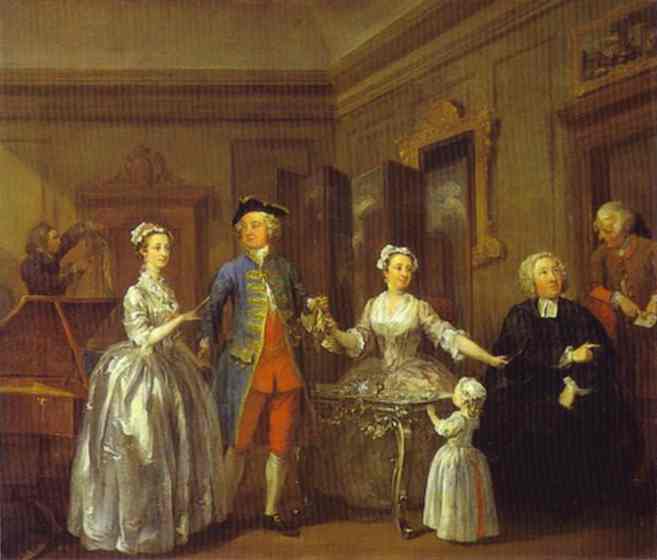 (Thomas and his wife Anne Callis - grandparents of Charles Callis) around 1730-1740. 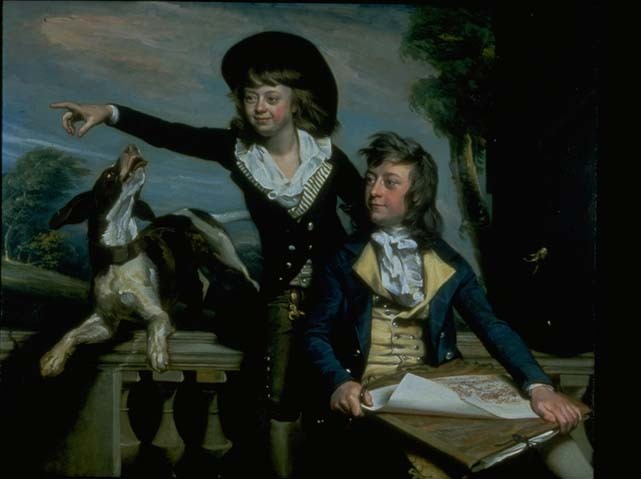 This painting is of Thomas Western & Mary Shirley (daughter of Sir Richard Shirley), Great Grand parents of Lord Western.